Despite the fact that the wooden flooring arethe undisputed leader among all kinds of flooring, old creaking boards are able to cross the entire effect from the new interior. That is why the indoor repair finishes the restoration or replacement of the base. 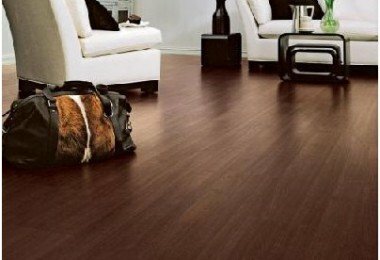 The choice of modern finishing flooring is very wide. This laminate and linoleum, and carpet. 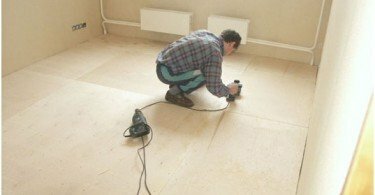 They can be spread out directly on the old floor, but in deciding on this, many are faced with problems such as eliminating the creaking wooden floor and leveling. That's about alignment and will be discussed in this article. So whether you need to align the floor before flooringlaminate or linoleum, or you can do without this work, because the new coating securely hide all the flaws of the old from prying eyes? Alas, it is not. Even the most durable coating, laid on curves shattered planks, very quickly lose their ideal shape and, consequently, their full gloss. If the plank soft coating, then it is allowed to base height difference of not more than 1 mm. Laminate Yet even with such a minimal difference may swell. Aligning the wooden floor with their hands - notsuch a complex process as it initially seems. With this work, following certain rules, it can handle almost any person with basic skills to work with the tools. 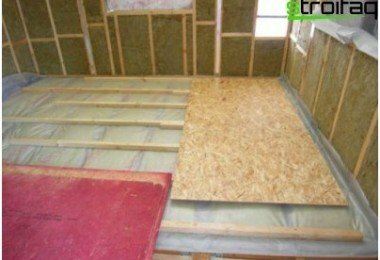 Plywood - this is one of the most convenient materials forfloor leveling. 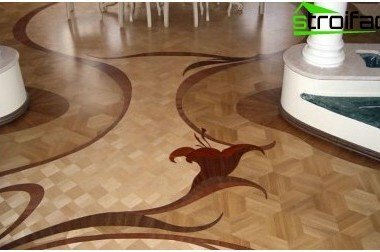 It can help you get a perfectly flat surface is rough, it is absolutely suitable for any surface finish, raising the floor by only 20-30 mm. In addition, the alignment of the wood floor with plywood is easy, fast and economical. Perfect alignment is a wooden floor under the linoleum. The moisture content of veneer sheets, designedfor leveling work should be the same as the total moisture level in the room. This can be achieved slightly moisten both sides of a sheet of water and stand them in a room for two days. Be sure to check the total plywood stackingthe status of all utilities located under the floor, because after that to get here will be very problematic, and make sure there is sufficient air circulation in the underground space. 1. First you need to install beacons, which are used as ordinary screws, screw-on the whole surface of the floor to the required height. They should be installed at least 350 mm. Tip: the thicker the plywood used to align, the less need to install beacons. 2. Now you are ready to install lag. 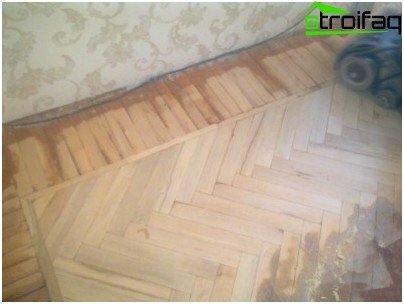 In this case it will plywood strips of thickness 30-50 mm. They attach with adhesive or intended for a tree or using screws. If any spaces between the old surface and the floor joists are formed gaps, paving them specially prepared pieces of plywood, smeared adhesive composition. 3. For ease of installation of plywood can be pre-cut into squares 600h600mm carefully while monitoring the bundle ends. If you see that it is still there, the material needs to be replaced - the quality leaves much to be desired. 4. The entire surface of the base of carefully trimmed from the smallest irregularities, and then from the resulting dust. 6. Extremely precise cuts through all the arches, ledges and bay windows. 7. Fix the sheets of plywood with screws with countersunk head. Tip: To cap screws do not stick out, fixing points and kindly nasverlit otzenkovat. Linoleum - the best bit sanded plywood surface, passing through her grinder. Focuses on the joints of panels and attachment points to the joists. With the help of fillers, based on PVA and sawdust for little money, you can align the floor surface area is large enough. First, you must thoroughly clean the surfacefloor. 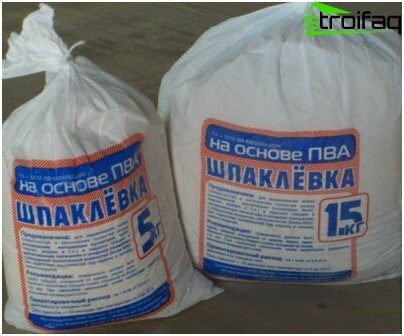 Sawdust, which is planned to be used in the work, you need to moisten. This is to ensure that they are not taken too quickly moisture from the PVA. On the floor stuffed slats that serve as a beacon. Expose them must be on the level. The entire space between the rails is filled with a mixture ofsawdust and PVA. If a thicker leveling layer, the coating is applied in several stages. For once filled no more than 10-20 mm in composition and each subsequent layer is applied only after the previous drying and shrinkage. The smoothness of the resulting surface is checked with a spirit level, additional irregularities are smoothed by applying putty if necessary. The main disadvantage of this method can identify the need for drying of each layer of putty, which leads to time-consuming, as well as the poor quality of the resulting coating. Self-leveling mix - a relatively newcoating on the modern construction market. 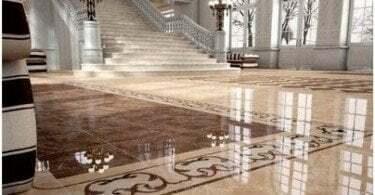 They are a part of, which is diluted to a liquid state is distributed on the floor surface and after drying forms a sufficiently elastic and smooth base for the laying of a new floor covering. Before applying the mixture of the wood floor must beprepared. All the shattered planks necessarily strengthened by means of screws, and all the heads protruding nails or screws pritaplivayutsya below floor level. Next, the base is polished and carefully cleaned of dust and removed layers of paint and varnish, with a vacuum cleaner. All the wide gap sealed with acrylic mass. Tip: for sealing cracks can use the same self-leveling mixture, but only diluted to a consistency of very thick cream. Then the floor is applied WATERPROOF primerproviding better grip mixture and subfloor. The lower part of the walls are insulated with a double-sided adhesive tape of the construction, and it, in turn, applied benchmark pouring mixture. Important: The level marked on the wall should not be less than the minimum thickness of the coating, the stated manufacturer of self-leveling mixture. To avoid overflow solution in the next room, near the door, attach the bar at a height of not planned level of self-leveling floor. On the prepared substrate is spread reinforcing mesh, which is attached with the help of construction stapler. 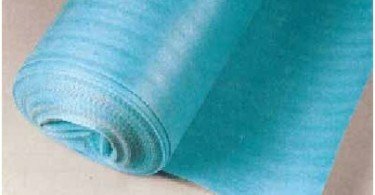 Combining mesh fabric, they should be placed with an overlap of about 50 mm. Prepare mix according to the instructionsproducer and thoroughly mix it with a drill with an attachment. Further, it must stand at least 15 minutes, after which it was again mixed thoroughly. On the surface of the floor is poured self-leveling mixture and carefully distributed across the surface of the squeegee, thus it is necessary to carefully monitor the presence of air bubbles. Tip: The air bubbles can easily escape from the rubber roller coated with a spiked. 4. Waiting for complete drying of the mixture, maintaining a certain temperature in the room. 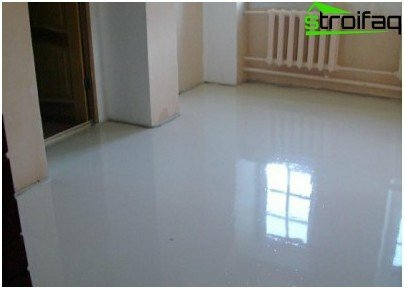 A significant disadvantage of usingself-leveling compounds, which, however, does not allow to avoid virtually any method - is to raise the level of the floor. But the convenience of such a confident alignment outweigh this disadvantage. Scraping - is one of the most labor-intensive, butwhile effective, methods of leveling the ground. You can scrape by hand, but, due to the high labor intensity and low efficiency of this work, we consider the manual scraping will not. First we need to remove all the curtains, coverexisting furniture protective film or polyethylene, otherwise everything would be covered with the fine dust which can not be avoided during tsiklevaniya. On the surface of the floor is necessary to remove all the buttons and deep carpets sink the nail heads. Important: if the scraping machines need to be in hearing protection and respirators, to prevent hearing damage and pulmonary tracts. Hands should be protected with thick gloves. Scrape start from one corner of the room, gradually moving towards the opposite corner of the "snake". 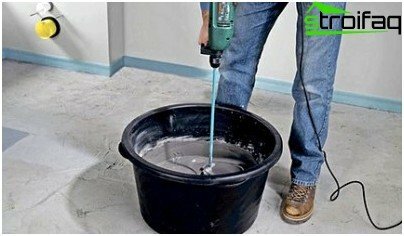 After removing the first layer of all the holes and cracks are sealed with putty, you should choose the same color as the floor. After complete hardening fillings continue scraping. Around the baseboards and other hard to reach places tsiklyuetsya floor with a hand corner tsiklevatelya. 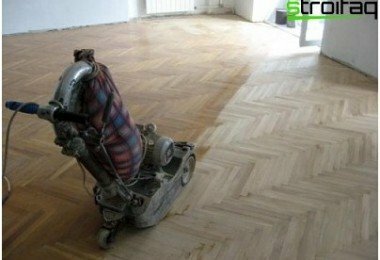 After complete sedimentation of dust surface is treated with a vacuum cleaner, wipe with a soft cloth dipped in a solvent, and varnish is applied to it. Tip: If any board is damaged, it can simply turn the setting to the same place. Easy replacement of the board will result in differences in the color of the floor. Of course, each method has its advantages anddisadvantages, so when you select should be guided by a particular situation and their own financial resources. Only carefully weighing all the pros and cons of each method, you can make the final choice and get a really high-quality output for years to come.